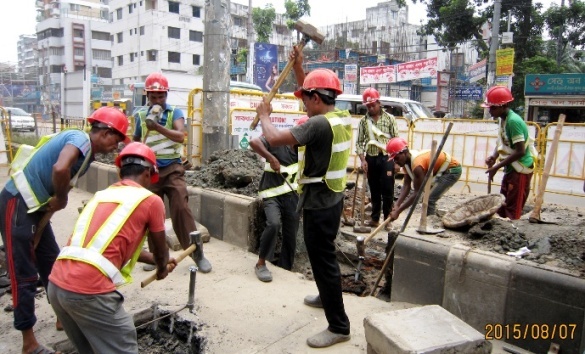 Government of the People’s Republic of Bangladesh has undertaken a project under DTCA namely Dhaka Mass Transit Development Project in order to implement MRT line-6 (Metro Rail) which was recommended in Strategic Transport Plan (STP). Basic design work was completed by 28 December 2014 and detail design work will come into an end by August 2016. The route alignment of MRT line-6, stations and depot location have already been approved by the Government. 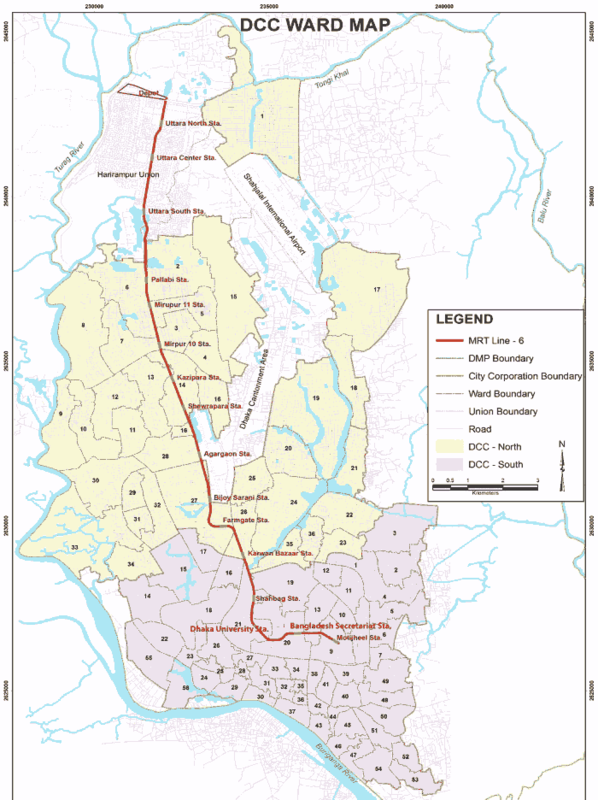 The final alignment starts from Uttara where RajdhaniUnnayanKartripakhya (RAJUK) planned Uttara Phase 3 for development of residential and commercial plots/area and ends at Motijheel passing through Pallabi – Mirpur 10 – Begum RokeyaSharani – Khamarbari – Farmgate –Sonargaon –TSC-DoelChattar-Press Club-Paltan and Bangladesh Bank. There are 16 stations proposed for MRT line-6. The selected places for stations are Uttara, Pallabi, IMT (Institute of Medical Technology), Mirpur-10, Kazipara, Taltala, Agargaon, ChandrimaUddan, Farmgate, Sonargaon, National Museum, Bangla Academy, National Stadium and Bangladesh Bank. All the way MRT Line-6 will be elevated. Rolling Stock: Composition of 6 cars. 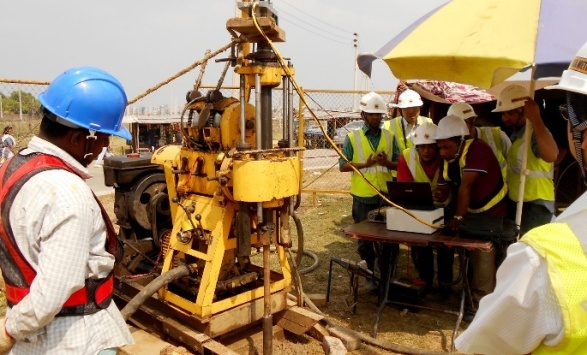 Completed Survey:Topographic survey, Traffic Survey, Historical importance s survey, Soil electric resistivity survey, Environmental base line survey. PQ Application of CP-08 (Rolling Stock & Depot Equipment for Rolling Stock) was received and opened on 21-8-2015. The evaluation is under process. The notice of PQ application of CP-07 (E & M System) was published on 18-03-2015. In total 31 PQ applications were sold. The date of PQ submission was 13 July 2015. 04 (Four) PQ applications were submitted. The evaluation activities are under process. Tender notice of CP-01 (Depot Land Development) was published on 22-04-2015. Evaluation activities are going on. Notice of PQ application of CP-03&CP-04 (Civil Works: Viaduct Stations from Uttara North to Agargaon) were published on 30-6-2015. The last date of PQ submission is 9 September 2015. 35 nos. PQ applications were sold till the date. 06 (Six) PQ applications were submitted. The notice of CP-02 (Civil and Building works in Depot) PQ application was published on 30-08-2015 and the last date of PQ submission is 03 December, 2015. Fourteen (14) PQ applications are sold till today. Project Assistance (JICA) = 16,58,737.88 lakh taka.